QUESTION: Which of the following artists is generally not associated with the art of the circus sideshow? The American Treasure Tour has a deep love of the circus, and we love to come back to that here at the blog whenever we can find an opportunity. Today, we would like to present one of the more odd characters depicted on one of the sideshow banners in our collection. We wish we could tell you the backstory behind it; unfortunately, we can only speculate about where it comes from. 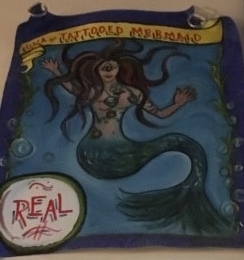 It advertises the miraculous Una, the Tattooed Mermaid. There is so much about Una that makes her special. For one, she's a mermaid. For another, she is tattooed. But for the third count, she is also a cyclops! That makes her a dimeshow triple threat - really, with a resume like that, visitors should have been forced to pay thirty cents to see her. Unfortunately, if Uno really existed, we have had no success tracking her down. We would love to be able to give a human face to Uno but, since that seems impossible, we would like to address some of what makes her profoundly unique. Being a mermaid is unusual enough! In fact, although the first reference to any sort of mermaid was written over three thousand years ago by Assyrians (they lived where the Middle East is now), there are no known women - or men - that have bottom halves of fish and the top halves of human, and likely never have been. Sailors mistakenly identified manatee and dugong as human ocean dwellers in the past. Being sea mammals, it's an easy mistake. People with the tragic rare condition called sirenomelia are born with their legs fused together. Few victims survive long after birth. You may also notice that Uno is a cyclops. The traditional cyclops, born with one eye in the center of their face, is largely fictional and dates to the time of the ancients like the story of the mermaid. They dominate many stories from Greek mythology. It's believed that a more familiar, and likely, origin for them tells of early blacksmiths who wore a patch over one eye to ensure they would not been blinded in both eyes should an on-the-job accident happen. So, we can only surmise that the unique physical appearance of the Uno advertised in the banner in our Toy Box may have been slightly exagerrated. She was likely not a real mermaid, and we can hope she did not have sirenomelia! Perhaps she did have only one eye, but we can hope she was also a blacksmith just trying to protect herself. If you know anything about Uno, please share! We would love to give her credit for her strangeness. ANSWER: B) Frank Gershwin. He was an artist of a different variety - specifcally an actor. His most famous role was that of The Riddler in the Batman television series of the 1960's.